Slovakian coat of arms is actually a heraldic copy of the "new" coat of arms of the northern lands of Kingdom of Hungary, except that Pan-Slavic colours are used - white, red and blue. The Byzantine double cross is probably associated with the christianising mission of Cyril and Methodius in the 9th century, and triple-peak mountain refers to the three mountain ranges of the northern part of the Kingdom of Hungary: Tatra, Mátra and Fatra, of which Fatra and Tatra is now in Slovak territory. An illustration of the 15th century chronicle of Istvan Thuroczy depicting King Stephen II of Hungary (1101-1131) with the coats of arms of the northern and southern part of Hungary. 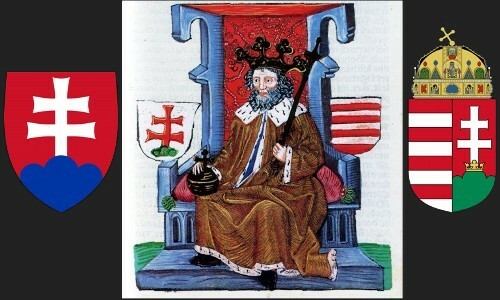 On the left, for comparison, the current coat of arms of Slovakia and of Hungary on the right.